1817 – On this day New York Governor Dewitt Clinton broke ground on the Erie Canal which would connect Lake Erie to the Hudson River. Completed in 1825 (and enlarged in 1836 and 1862) This canal would be instrumental in turning New York into the financial capital it is today as it opened new markets and trade to West. Originally, ships would be moved through the canal with rope pulled by a team of horse and/or mules. Read more about the canal here. 1826 – On the 50th Anniversary of the Declaration of Independence, two of the most instrumental of American founding fathers, John Adams and Thomas Jefferson, would die at their homes. According to his son John Quincy, John Adams last words were, “Thomas Jefferson survives”. In truth, Thomas Jefferson, his friend turned political adversary, had died hours before. 1855- Walt Whitman publishes the first edition of Leaves of Grass, arguably the most influential collection of poems in American history. 1863 – The Confederacy is dealt a crushing blow when they surrender to Ulysses S. Grant in Vicksburg, Mississippi, only a day after Robert E. Lee surrendered to the Union at the Battle of Gettysburg. By seizing Vicksburg (a task that took 40 days), the Union army was able to break communication with Confederate forces west of the Mississippi River. This surrender filled General William T. Sherman (whose forces were part of the seizure) with great patriotic pride. You can read about it here. 1881 – The Tuskegge Institute is founded, with Booker T. Washington serving as its first president. 1884 – In Paris, the Statue of Liberty is presented to Levi P. Morton as a statement of friendship and as recognition of both the French and American revolutions. 1910 – Jack Johnson defeats Jim Jefferies in what was billed as the “Battle of the Century in Reno, Nevada. 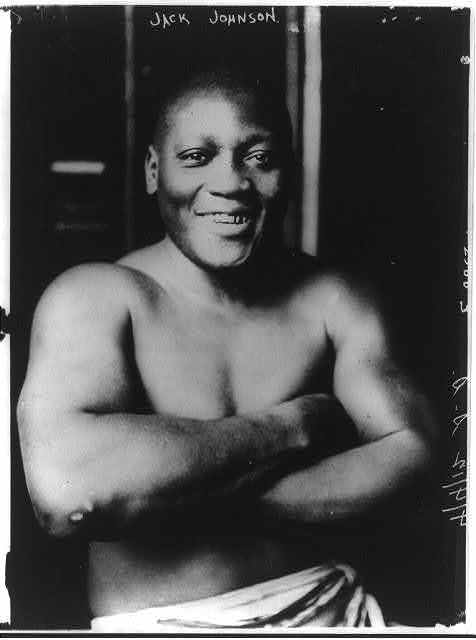 Johnson, the first African American Heavyweight Champion, won the fight after Jefferies (who had previously retired as champion three years ago) threw in the towel in the fifteenth round. Jeffries was coaxed out of retirement by Jack London who hoped he would regain the boxing title for the ‘white race.” In the aftermath of the fight, whites attack celebrating blacks across the country and as many as 26 people (a vast majority black) die in race riots. 1939 – Lou Gehrig announces his retirement from Major League Baseball at Yankee Stadium. In his brief speech, he famously declares himself, “the luckiest man on the face of the earth. I wrote previously about this moment here. This entry was posted in American Government, American History, Baseball, Erik Randall, Politics, Popular Culture and tagged American Civil War, American History, American Revolution, Baseball, History, Independence, July 4, Popular Culture, Sports. Bookmark the permalink.